Can measure headers be hidden? Hi, we need to hide the measure headers. In the attached file you can see an example. We would like to hide the “Recompte”, “% FILA” and “% COLUMNA”. How can we do this? Furthermore, if the previous is possible. 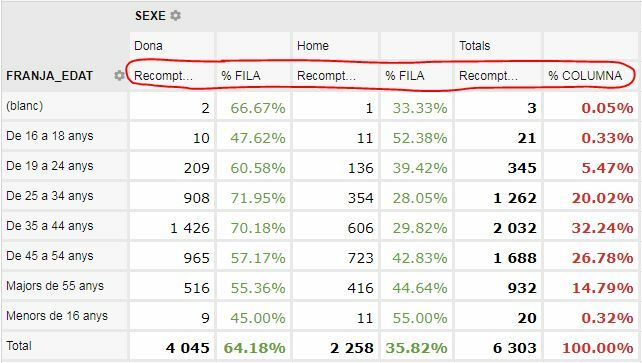 Could we also add “% Dones” in the cell next to the “Dona” cell, “% Homes” next to “Home” and “% Totals” next to “totals”? It is not possible to hide the measure cells. However, you can remove measure’s caption using customizeCell approach. Also, you can change the member’s caption using the same approach. Please find the example here: https://jsfiddle.net/flexmonster/zaLcbmk5/.